It was the hottest August day in the history of San Francisco, smack in the middle of the coldest summer since 1975. So for our Tuesday night sketch-out we headed for the cooling breezes coming in off the Pacific Ocean through the Golden Gate Bridge (in the center of the picture above, to the right of the San Francisco skyline). We weren’t alone. 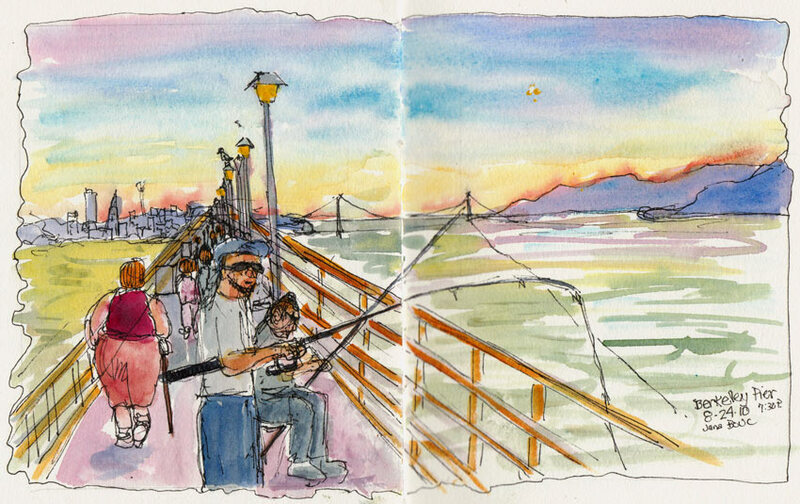 The pier was full of people strolling and fishing and enjoying the rare warm evening. 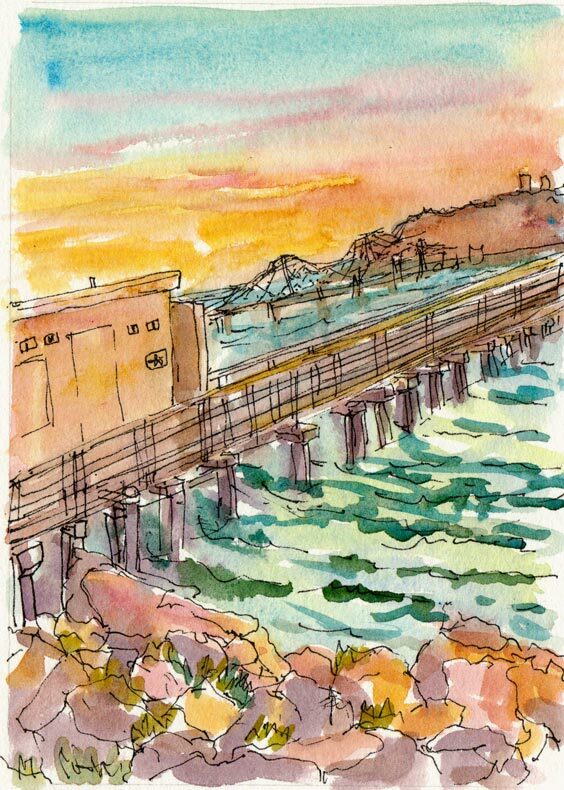 Although my sketch buddies selected a more scenic perspective from the same vantage point (which you can see on our Urban Sketchers Bay Area blog here), the men’s bathroom and shoreline rocks glowing pink and orange in the sunset attracted me instead. Apparently I was holding my sketchbook at a strange angle as I was drawing and painting (or else the world temporarily tilted) causing the wonky slanted horizon and bridge. The sky turned indigo blue as we walked back down the pier towards land, and a huge full moon rose over the hills. Then a group of half a dozen kayakers with little headlights on their boats paddled right under the pier and out the other side below us. It is special sights like this that make getting out in the world to sketch so special. These are great Jana. You seemed to captured the essence of the places. I think they’re great, wonky horizon and all! And I love your description of the full moon and the kayakers…..you’re right, those are the moments that make getting out so special and worthwhile. Lovely colors! I can’t tell you how many times I’ve finished a drawing only to realize I’ve draw crookedly on the page!